Now that I have semi-recovered from my annual mashed potato induced Thanksgiving stupor, here’s the pulp cover of the week. 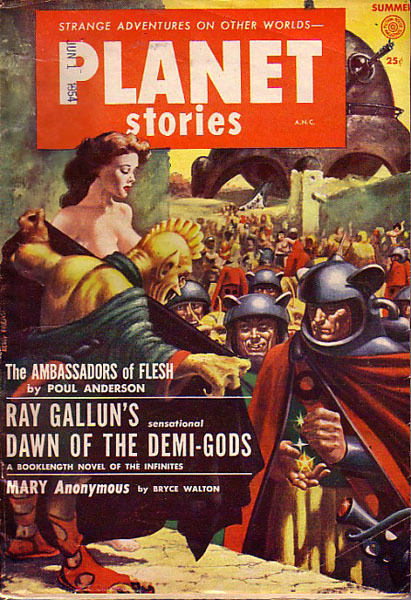 Since I mentioned the legendary PLANET STORIES last week, I thought I’d go with one of their covers this time around. PS specialized in tales of interplanetary adventure and daring-do set in a much more innocent milieu where Mars was prone to ancient civilizations, Venus was a steamy swamp planet, and there were all sorts of interesting aliens races on Mercury, Mars, Saturn, and even Uranus. Tough to go wrong with any of the covers, actually, but here’s a classic image by one of the really great science fiction illustrators, Kelly Freas.